Qualcomm has confirmed to TechRadar that it will be adding in support for its augmented reality framework for Android phones in the near future. Jay Wright, director of business development for Qualcomm's corporate R&D, was showcasing the power of the company's augmented reality technology, and told us that it would be available to developers in a few weeks. "We're adding it into our SDK, which will be available on Qualcomm's developer page. "This could mean adding 3D content to existing apps or games, and we'll continue to evolve the technology as well." But which one is strut F-6? 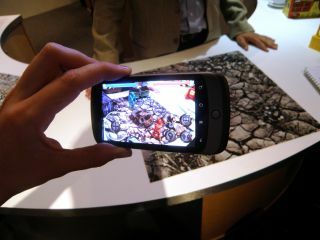 Wright envisages multiple opportunities with Qualcomm's augmented reality (which uses a phone camera to overlay objects or information onto the screen). "If you need to see how to change oil on your car, or put together or fix Ikea furniture, then you could just hold up your phone and see the instructions on the screen," he added. Although the apps developed are essentially out of Qualcomm's hands once the SDK is released, Wright believes greater augmented reality could be on the Android market in 2010, as already developers working with the tech in private beta have new applications in the pipeline.